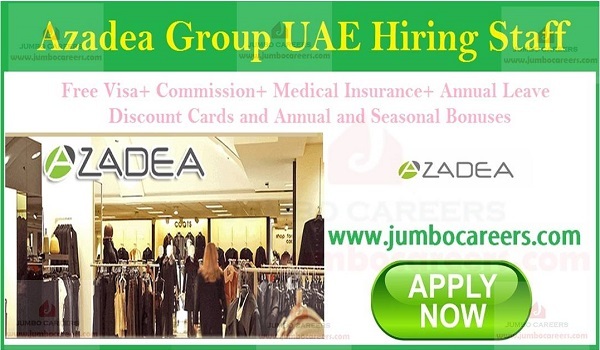 Azadea Group is urgently hiring staff for different locations across UAE. About Azadea Group: Azadea is incredibly successful leading multinational retail chain companies of more than 50 international brands. In 1978, Azadea opened its first ever smallest clothing store in Lebanon. Now the group owns more than 50 franchise outlets in Middle East & Africa. Benefits : Free Visa+ Commission+ Medical Insurance+ Annual Leave+ Discount Cards and Annual and Seasonal Bonuses. with hope, strength and courage to make it happen. At that time, they were in the middle of nowhere but there was a hope of winning. A few years later, they got celebrate their first success by winning its first international retail franchise name. And 2 decades later, the company grown massively and taken its own place as an international brand and opened several franchises in across the Middle East. “What a turn around from the smallest clothing store to the multinational companies of more than 50 franchise around the Middle East and Africa“.